Lack of energy. It’s a common feeling amongst us nurses and we all feel it to some extent. There’s only so much caffeine and on-the-go foods that can help us sustain the energy we need for a twelve hour shift. In the moment, it seems necessary to go for that second or, third cup of coffee, scarf down a power bar between morning vitals and meds, or get your afternoon fix with the graham crackers and peanut butter from the pantry. How’d I guess? We’ve all done it. These are habits that seem harmless in the moment but are hard to break and are entirely instant gratifiers. So I’ve been curious about longer-term solutions – and prevention! I’ll be the first to admit that it’s not hard to find an excuse for just about everything during a shift. It’s seemingly quite easy for us nurses to sometimes feel bad for ourselves or find ‘reasons’ to deserve some of these bad habits. Ugh I had to get up at 5:15am and I’m still here for ten more hours. Yep, I need that second coffee, I just can’t afford to feel tired later. I’m not even hungry right now but I know my day is going to be crazy. I need to eat while I can so I’m not starving later. Oh, and need to do it fast, because I only have a ten minute break. But it’s night shift and it’s 2am and I’m already tired and my patients are all sleeping… yeah, I deserve a light night treat. Okay, this must be what true hunger feels like. Brb. Escaping to my locker. Will I be able to finish my snack before my phone rings again? Doubt it. This self-talk has a huge effect on our actions and our ability to change them.. Yes, we work twelve hours. Yes, they are often long and busy shifts. But that’s what we ‘signed up for’, isn’t it? Instead of dwelling on all of the negatives aspects and finding excuses the approach has to be recognizing that it is the norm and adapting to it. There are very few excuses for justifying unhealthy choices or letting your health take the back seat, especially if you haven’t tried alternatives. The schedule, the hustle and bustle, and the chaos of our profession are here to stay for the foreseeable future. So, how can you find the positive energy to create and sustain healthy habits? It’s mind over matter. And strengthening the mind to withstand even the most stressful, exhausting shifts or situations. My biggest advice is preparation. Whether it be mapping out your schedule and penciling in some “you time” or meal prepping for the week ahead, preparation is the easiest way to avoid instantly gratifying decisions. Be realistic about the goals you do set. This includes being mindful of implementing too many changes at once. Start with small, simple changes and holding yourself accountable to them. . Over time, you will figure out what works best for you and what makes you feel your most positive, energetic, healthy self despite having the complex and sometimes grueling schedule of a nurse! We know it’s easier said than done and aren’t here to just preach (er, motivate!). 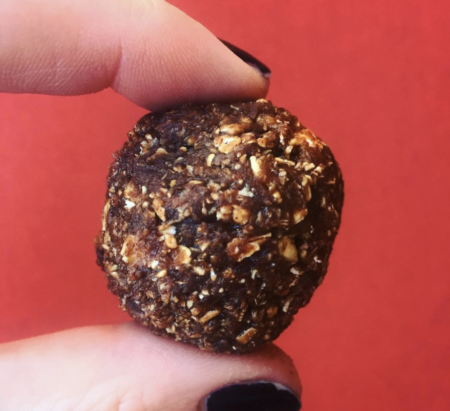 So here’s one of our favorite go-to recipes for a snack to keep on-hand that’s small enough to be enjoyed fairly quickly (but mindfully!). And it’s easy to tweak with different ingredients to fit your taste. We want to know what you think! Remove the pits from the dates and soak in warm water for about ten minutes. Rinse and add to a blender or food processor with the oats. Blend for about 30 seconds and then add in the remaining ingredients. Continue blending until a dough is formed, you may need to take a spoon and scrape the mixture off the sides and bottom of the blender as it gets sticky. Store in the fridge for 15-20 minutes to harden. Roll into balls (makes 12-14) and store in the fridge in an airtight container. Happy energizing!